← The Leader as Learner . . . The New F-word in Business . . . There are tons of new fads in the world today. I guess we have the internet, social media, technology, ample spare time and the ease of communication to thank. New diet fads (Hollywood diet, Acai Berry diet, Cabbage Soup diet, Mayo Clinic diet, Apple Cider Vinegar diet to name a few), App game fads (Fruit Ninja, Angry Birds, etc. ), teen fads (tattoos, cutting, condom snorting?, and others too weird to mention). Business, and especially the areas of management and leadership, are ripe for fads as well, some effective, most just catchy phrases that sell books and speaking engagements for the authors. Jack Welch continues to share his philosophy and experiences as the “greatest executive of the 20th Century” (according to Forbes). Then there is the fad of business parables that contain one or more success principles (Patrick Lencioni’s books come to mind), and all the “secrets” of success in business and leadership (21 Irrefutable Laws of Leadership, The Contrarian’s Guide to Leadership, Leadership Lessons of Genghis Khan, The Tao of Leadership, etc.). While there are many fad business books, there are also some classics that actually do provide excellent and seasoned advice. Books like “Good to Great” and “Built to Last” by Jim Collins, “How to Win Friends and Influence People” by Dale Carnegie, “Think and Grow Rich” by Napoleon Hill, “The Greatest Salesman in the World” by Og Mandino, “The One Minute Manager” by Ken Blanchard, “Reengineering the Corporation” by Hammer and Champy, and several others offer timeless and proven advice. One of my all-time favourite business words, which should definitely be a fad, is FOCUS. Focus is the new F-word in business. Too many companies, full of good ideas, good products and great people, flounder due to a lack of focus. Spreading themselves too thin, wasting time, effort and money chasing too many “shiny objects”, having lots of projects in the pipeline but not getting traction on any. Lack of focus is one of the biggest speed bumps on the road to success. 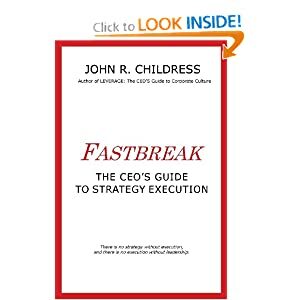 Consider the situation Allan Mulally found when he was recruited in 2006 to turn around a failing Ford Motor Company (see Chapter 12 in FASTBREAK: The CEO’s Guide to Strategy Execution for more on this story). Once a global powerhouse of automotive styling and manufacturing, Ford had diversified so much that, with brands such as Volvo, Aston Martin, Land Rover and Jaguar, plus operations in Europe, Turkey, Russia, China, South Africa, it was spread too thin for its available finances and management talent. Winning in a highly competitive global marketplace takes attention to every little detail that is important to the customer. It takes FOCUS, and Ford had definitely lost its focus. By selling off the non-core brands, cutting “pet projects”, setting a simple vision (One Goal, One Team, One Ford), defining a few key breakthrough objectives, and having weekly business review meetings with all executives from around the globe, Mulally brought an intense focus to the turnaround at Ford. Too many businesses lack focus and alignment and wind up wasting time and energy. What are the two or three critical areas your organization is focused on? If you don’t have a sharp focus, there is probably another F-word in your business that takes over! This entry was posted in consulting, corporate culture, Human Psychology, John R Childress, leadership, Life Skills, Organization Behavior, strategy execution and tagged Allan Mulally, Aston Martin, Bruce Lee, Dale Carnegie, Fastbreak, focus, Ford Motor Company, Good to Great, Jack Welch, Jaguar, Jim Collins, Land Rover, Og Mandino, Patrick Lencioni, Power of focus, Volvo. Bookmark the permalink. 2 Responses to The New F-word in Business . . . I read a book called “Focus – The Future of your Company Depends on it” (Al Ries) several years ago. 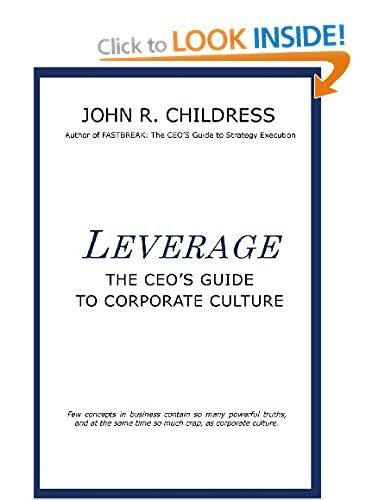 It was one of the most important business/leadership books that I have read. John, you are on point on a critically important subject. David: I notice that kids today have a Focus challenge with all the modern distractions. Thanks for your comments, as always.